Anna Lynch, Scott Ward Abernethy, Louis E. Davis, and Dallas Tolentino in “The Master and Margarita” at Constellation Theatre Company. Photo by DJ Corey Photography. My guest for the performance, who I mistakenly thought had read Mikhail Bulgakov’s Stalin-era novel, took a glance at the plot synopsis inside the program and was immediately baffled. Indeed, “Master” is not an easy work, on the page or on the stage. Bulgakov presents three stories — that of the unnamed Master (Alexander Strain), a playwright (novelist in the original), and his devoted lover Margarita (Amanda Forstrom), an homage to Gretchen in Goethe’s “Faust;” the subject of the Master’s work, a physically and psychologically tormented Pontius Pilate (Jesse Terrill), weighing the fate of a Nazarene street preacher; and a visit by the Devil. It’s this last that is most remembered, and which is most played up in Allison Arkell Stockman’s production. While Kemp and Stockman elide past some of the satirical elements of Bulgakov’s book in favor of spectacle, it is the smart choice. There is simply too much in the source material to include it all; Stockman instead offers a garden of demonic delights. Satan, here in the form of a charismatic stage hypnotist called Woland (Scott Ward Abernethy), arrives in Moscow in order to revel in an atheistic culture. He is accompanied by wily Fagott (Dallas Tolentino), seductive Azazallo (McLean Fletcher), and — most famously — the giant cat Behemoth (Louis E. Davis). 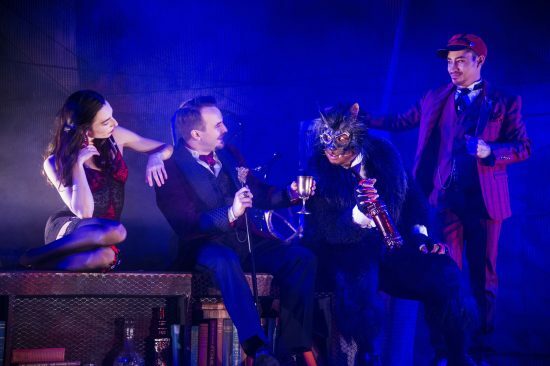 Abernethy is particularly sublime as he holds court; a delicious and wild spring ball featuring history’s most notorious killers, in which Margarita plays somewhat reluctant host at his side, is alone worth admission. Strain and Forstrom have the harder part, playing two very real characters surrounded by monsters and caricatures. Strain portrays the Master as a suffering artist without piling on the angst; Forstrom expresses devotion to her man without it becoming cloying or sacrificing her agency. A.J. Guban’s set is stark but intentionally so, as his lighting design is used to great effect. Erik Teague’s costumes are sumptuous and add some bright colors to the often-dark proceedings. “The Master and Margarita” has been extended through March 10, 2019, at Constellation Theatre Company at Source Theatre, 1835 14th Street NW, Washington. Click here for tickets.